The play that this performance comes from, the Otokodate iromo Yoshiwara, is an Edo version of the better known Natsu matsuri Naniwa kagami. This play opened in the 7/1815. In his right hand Utaemon is holding a sandal* while staring at it intensely. 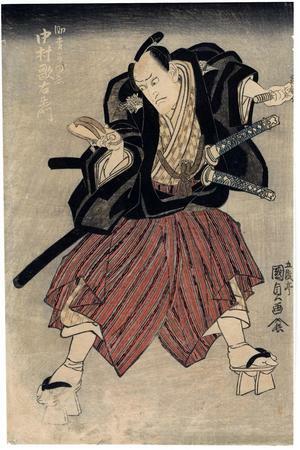 In his left hand he is holding the handle of a closed umbrella which is resting on the shoulder of a figure - not shown here - who dominates the right hand panel of the triptych and who is about to strike with his upraised sword..
*Sandals are often used as props in kabuki plays and more often than not they indicate an element of a coming strike from a vendetta or a past act of revenge. Clearly the sandal is not Utaemon's because he is wearing a pair of geta, standard footwear for many otokodate. Elsewhere Sukematsu Kazue is referred to as a physician. The actor's name and role appears in white reserve in the upper left of the sheet.